Okay, those aren’t my feet, they belong to Chula who took a shot with my camera. Chula says she likes to take photos of herself when she’s bored. It was a pretty slow day, kind of overcast, hot and muggy. I’m not sure about those TV weather folks who said Kona had the low temperature in the state at night as it didn’t feel that way. Chula with a big (what do they call it at BK? 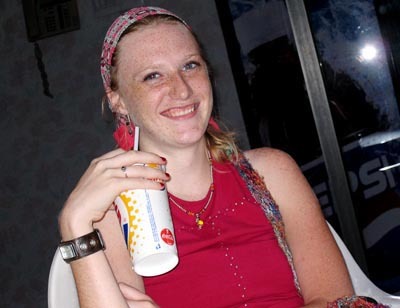 Super-Sized is McDs, Biggie is Wendy’s) Burger King drinks. It used to always amaze me how I’d see little kids sitting on the curb in front of 7-Eleven with one of those monster super-sized Biggest Big Gulp drinks, holding onto a cup the size of their heads with two hands. Not sure how they drink that stuff, maybe they end up spilling it or maybe it was never full in the first place. Okay, her drink isn’t that big, by American standards, probably just a medium. The Rock. There’s a back-story behind this rock which I’ll get into on a future blog post. 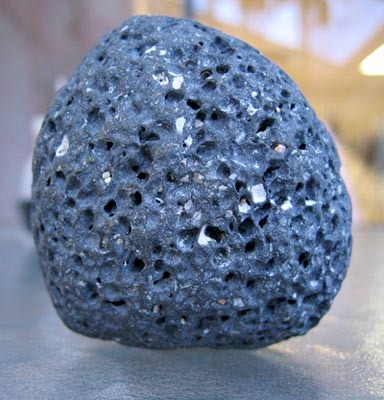 It has to do with the superstition that taking rocks from Hawaii is bad luck and folks send lots of rocks back from the mainland after bad things happen to them. Let this be a warning, don’t take rocks home from Hawaii, it upsets the gods or worse yet the goddesses. This rock will find its way home this week. 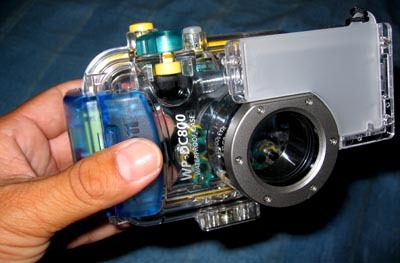 Just got this in the mail today, it’s an underwater housing for my new Canon PowerShot s500 digital camera. Sweet! There are some times when having a housing would be nice while on assignment. I do have an Ewa-Marine housing for my bigger film camera but it’s hard to work the controls. This high-tech housing has controls for every button and switch on the camera. It’s good down to 130 feet in depth but it’ll probably find more of a workout during rainstorms, or snorkeling. Very spiffy. Finally I got a call tonight by Chula saying I’m famous or at least my photo is. 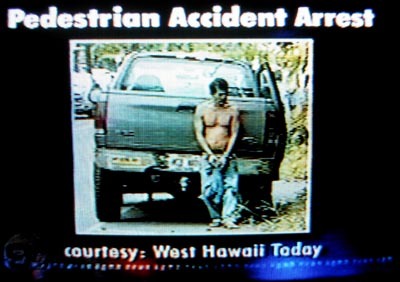 Seems KGMB-TV in Honolulu wanted to run one of my photos on their 10 p.m. newscast regarding a pedestrian accident I shot yesterday. The editor gave them permission and here it is. Credit for the newspaper but none for me of course. I don’t mind that much but how about some money for the shot? They pay for video being submitted for their newscasts. I mean, sure I’d like some money but even if the paper got the money we could use that to buy some extra photo gear we don’t have like maybe a tripod, batteries and the like. Our photo department is really lacking basic equipment and here we are giving away photos to the competition. Okay, I don’t want to end on a negative note. Ah, did I mention I got a new underwater housing today?….